The inimitable Sally Zurn Mead passed away suddenly and peacefully, on Saturday June 14, 2014, at her home in Albuquerque, N.M. She left the world on her own terms, just as she lived her life. Sally was born in Erie on November 8, 1930, the daughter of the late Melvin and Marian Zurn. She enjoyed a childhood of sailing, sports and a wonderful circle of friends. She graduated from The Masters School, class of 1948, and attended Northampton School for Girls. Sally then attended Denison University, and left to be courted by her future husband, James M. Mead. Jim and Sally wed in August of 1953. They enjoyed fifty-one years together, until Jim’s death in 2005. Sally made many beautiful homes for her family in Charlottesville, Va., Philadelphia, Pa., Princeton, N.J., Washington, D.C., and Albuquerque, N.M. Sally was an accomplished athlete, and particularly enjoyed tennis and golf, becoming tennis champion at the Philadelphia Cricket Club, and golf champion at Springdale Golf Course in Princeton. Sally spent many happy years in her manager position at the Junior League Shop of Washington, D.C.
David Edward Coleman, formerly of Larchmont, passed away April 7, 2014. He was 60. Born April 28, 1953 to Cecilia Maguire & Arthur Leo Coleman, David worked as financial analyst and relocated to Virginia in the 80’s. He is survived by his wife, Daryl Dorsey Coleman. David is the loving father of David Edward, Joseph Dorsey and Colleen Cecilia. Cherished grandfather of Sophia, Joseph, Boris, and Ashley and dear brother of Arthur, Edward, Mary Cecilia, Peter, Paul, Gerard, and Eugene. He is loved and will be missed by all. Robert H. Matthias passed away peacefully on Wednesday, May 28th while looking out a window where he lived at Maris Grove. Bob was born in Bridgeport, CT, to the late Virginia and Frederick William Matthias, Jr. and was raised with his two brothers, Bill and Donald, by his mother after his father passed away. 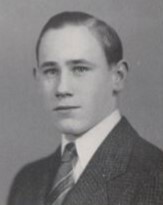 He graduated from the Williston Northampton School in 1941 and then went on to study at Amherst College. Postponing graduation with fellow classmates, Bob entered the US Navy where he served as a WWII pilot and flight instructor in Pensacola, Florida. He resumed his studies after the war and graduated with the class of 1945 from Amherst in 1947. He also attended Brown University and University of North Carolina before starting his career with DuPont in 1952.